This Experience will take you to the towns and cities along the Charente river. 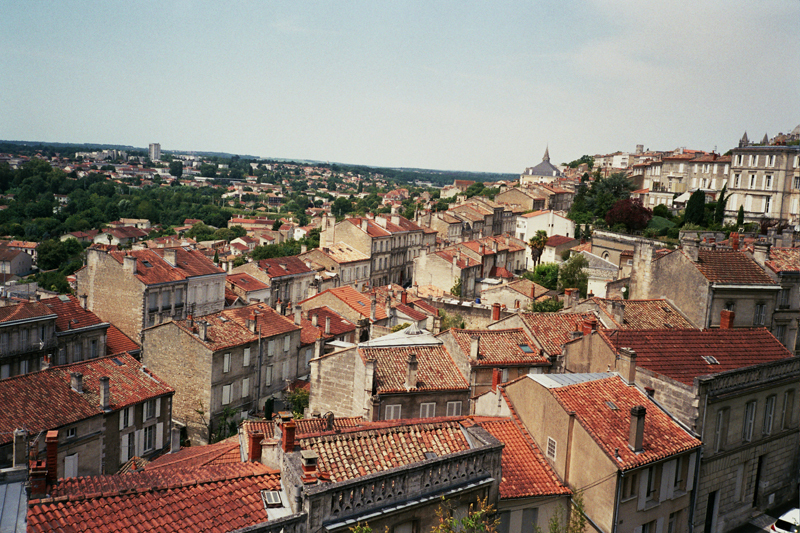 Locations visited will be the hilltop city of Angouleme, nicknamed “the balcony of the southwest” due to its wonderful views. Jarnac, the home town of the late French President François Mitterrand. Cognac, home of the famous brandy. And Saintes, once the region’s Roman capital, with a 65 hectares conservation area of historic monuments. Each location will offer unique and exciting opportunities to explore and photograph the old and the new, and the contemporary French life amongst it. This Experience will encourage participants to think about capturing “a sense of place” in their photographs in a new way. Four days trips will be taken by train to the locations. The other two days will be spent in the village of Verteuil. On the first day Justin will introduce some ideas and approaches to photography and you will have the chance to explore and photograph the village. The final day will be spent reviewing your photographs from the week and will also include a tour of the chateau. Accommodation is three star in shared rooms on first and second floors of the house. There is a shared bathroom on the first floor. Breakfast, tea and coffee and other refreshments will be provided. A French breakfast will be provided each morning with fresh croissants and bread straight from the boulangerie opposite the house, along with fruit and yoghurt. A "plat de jour" lunch will be eaten as a group in a local café or restaurant in the cities we visit. Dinner will be eaten as a group at a restaurant in the village of Verteuil. There will also be an option to visit the local wine bar after dinner where we can continue our conversation about the day’s photography if participants wish. Breakfast, lunch and dinner are included in the Experience price. Wine, beer and other drinks are not included to allow participants to order at their own discretion. How to book and pay: Please contact Justin Partyka on the email address below to reserve a place and pay a deposit. The balance of 1500 € is due 8 weeks before the Experience begins. Location: Verteuil, Angoulême, Jarnac, Cognac, Saintes - region of Nouvelle-Aquitaine. Language: English and basic French. Digital camera: SLR, mirrorless, or point and shoot compact camera. Film camera users are welcome to come on the experience but unfortunately there is no film processing available locally. (For cameras with changeable lenses, if possible please bring a single focal length 35mm lens on a full frame camera or equivalent 23mm for APS sensor). SD cards, batteries and charger. Laptop computer with photo viewing software and SD card reader. Train travel for four day trips during the experience and from Poitiers on arrival and back to Poitiers on departure. Short car journeys from Ruffec train station to the workshop base in Verteuil. Tour of the chateau of Verteuil. Travel to Poitiers for the start of the experience and from Poitiers on your departure. Participants are advised to travel to Poitiers by train as our meeting place will be the city’s main train station for our onward journey to Verteuil. Please plan your journey to arrive in Poitiers before 4pm. Direct trains to Poitiers are available from Lille and Paris (including Charles de Gaulle Airport) in the North and Bordeaux in the South amongst other places. If you would like advice on travel and suggested train times etc, please get in touch. If you have any questions about this Experience or would like to receive confirmation of the price when available, please contact Justin. Places are limited so if you are interested it is advisable to reserve your spot as soon as possible.